This office has been around for a long time 60 years this winter, to be precise. Still, whenever! say! work for Rodgers & Hammerstein, I often get one of two responses: either people are surprised to learn that R&H set up their own business in the first place, or they are intrigued to learn that it is still in operation, since both of its founders are long gone. Well they did, and thankfully, we still are. In this article, Bert Fink takes us through the founding and glory days of R&H as a production empire; in our next issue hell take us up to the present. They were the biggest force on Broadway when Broadway was the biggest force in popular entertainment. They produced plays, musicals, concerts and revivals. They presided over Broadway runs, London transfers, national tours and major motion pictures frequently all at once. They held onto everything they could, and controlled their own destinies. They were lionized and they were envied. And they kept their perspective. We may be big, Richard Rodgers once said. But were not U.S. Steel. As artists, Richard Rodgers and Oscar Hammerstein II revolutionized the American musical. As businessmen, R&H revolutionized Broadway. Rodgers and Hammerstein fully understood that the show is just half of show business, wrote business historian John Steele Gordon in American Heritage (1990). They became the first men from the creative side of Broadway to establish a permanent organization to handle the business side of what they created. In doing so, they built a business empire that earned them the first great American fortune to be based on creative theatrical talent. Like ASCAP, which had been established a generation before, R&H wanted to protect the writer; that they were writers themselves made the duo especially sensitive to the issues. They both detested Hollywood because there the writer was well paid but stuck at the bottom of the evolutionary scale; but on Broadway, on stage, they knew the writer could and should have control over his or her work. Producers held too many of the cards, they felt, and the best way to wrest some of that control was to become producers themselves. As Gordon explains: In the 1920s and 30s, the authors of Broadway musicals usually got the short end of the stick, receiving a relatively small percentage of the gross receipts while the producers and the backers made off with the lions share of the profits if the show was a hit In addition to being financially marginalized, authors had little or no say over how their material was used. In his autobiography, Rodgers recounts his Broadway debut in 1920, when a score he wrote with Lorenz Hart for a show called POOR LITTLE RITZ GIRL had been brusquely jettisoned by the producer without their knowledge. Even now, he wrote in 1976, I can still feel the grinding pain of bitter disappointment and depression. That incident transformed Rodgers. Protecting his own creations became a lifelong policy, and a credo he passed down to his children. The Bible in our house, his daughter Mary later recalled, was never sell your copyrights. Daddy used to say it was like selling your birthright. In 1942, Rodgers and Hammerstein began writing together under the auspices of the Theatre Guild; their assignment was to make a musical out of the Guilds play, GREEN GROW THE LIlACS. With the bold artistic strides he and Hammerstein were making on the score for what would become OKLAHOMA!, Rodgers had a bold business notion too. Wed be suckers, he told Hammerstein, if we didnt publish it ourselves. Other songwriters had been their own music publishers before (Irving Berlin being a prime example and stellar success), but with OKLAHOMA], R&H were seeking to set a system in place that would protect and nurture their works and those of others for decades to come. Max and Louis Dreyfus, the brilliant and legendary music publishers whose Chappell & Co. had published most of Broadways music for years, were not only receptive but agreed to create and administer this new entity, which would ultimately be owned by R&H completely. The enterprise was called Williamson Music (so named because both men had fathers named William) and, in 1944, it was established in a suite of offices at 488 Madison Avenue. It is still in business today, with dozens of writers and thousands of songs under its administration. But it all started with the score of OKLAHOMA! With Williamson Music up and running, R&H had further ambitious to fulfill: controlling their own songs was one thing, but controlling an entire production was another. R&H decided that it was time they become Broadway producers. Though unprecedented, this career move had a certain logic. Between them, R&H had decades of experience in theatrical production, learned by osmosis and observation. Hammerstein was born into the third generation of a theatrical impresario dynasty; he knew well the legends and lore of his remarkable namesake and grandfather Oscar I, and he had watched closely as more than a dozen of his own musicals were produced by his uncle, Arthur Hammerstein. Rodgers, meanwhile, had soaked up every detail of production during his collaborating years with Lorenz Hail. He had a knack for the business from the start, and that fascination only grew. With such musicals as ID RATHER BE RIGHT, BABES IN ARMS and PAL JOEY Rodgers learned production from some of the best, including such gentlemen of the trade as Sam Harris, Dwight Deere Wiman and George Abbott. In 1942, Rodgers co-produced a musical with Abbott, BEST FOOT FORWARD, that he had not even written (save for one unattributed number). Later that same year, he shared producer billing with Wiman on the last new Rodgers & Hart musical, BY JUPITER. The following year, Rodgers produced the revised version of A CONNECTICUT YANKEE by himself. Early in 1944, with OKLAHOMA! going strong and new R&H writing projects in the works, the team launched their adjunct career. A small office in Room 511 of the RKO Building at Rockefeller Center became home to their production firm, Surrey Enterprises. Its staff consisted of one business manager and one secretary. Its first venture was a play called I REMEMBER MAMA (which later became the basis for Rodgers final Broadway musical) and the author was John van Druten (who would later direct THE KING AND I). It was an enormous hit, and R&H producers-were off and running. While they continued to serve as authors for their producing colleagues at the Theatre Guild following OKLAHOMA! (1943) with CAROUSEL (1945) and ALLEGRO (1947) plus a brief stint writing STATE FAIR for Hollywood (1945), R&H were fast becoming prime producers in their own right I REMEMBER MAMA was followed by Irving Berlins blockbuster ANNIE GET YOUR GUN (1946) the first time a Broadway composer had fellow writers as his producers. Next, R&H presented a hugely successful tour of SHOW BOAT (1947), Hammersteins masterpiece written with Jerome Kern. OF THE MAITER by Grahame Greene (1950); and BURNING BRIGHT (1950) by John Steinbeck. The Greene closed out of town in Boston, the Steinbeck was a quick flop on Broadway, but the other plays were smash hits courtesy of R&H. Finally, after five strong years of producing the works of others, R&H were ready to produce their own. SOUTH PACIFIC (1949) was the first musical featuring Rodgers and Hammerstein above and below the title; they would go on to produce, or co-produce, every one of their musicals from then on. From Business Week, August 1951: In the matter of contemporary success, Richard Rodgers and Oscar Hammerstein II are at the peak of their profession... Since forming their production partnership in 1944, the two have become the most successful firm on Broadway. Since R&H did not divulge financial figures (a policy we still adhere to), the rumor mill ran rampant with exponential theories of multiple revenue streams, cash geysers, and dollar figures that climbed higher than an elephants eye. Against these tall tales R&H did go on a spending spree, of sorts: they bought the producers rights to their earlier musicals from the Theatre Guild. Now they owned everything they wrote, and could accomplish such mind-boggling feats (for their day, and ours) as establishing their own film company, the Rodgers and Hammerstein Picture Corporation. They subsequently presented the film versions of OKLAHOMA] (1955) and SOUTh PACIFIC (1958), and managed to secure extraordinary control over their other movies as well. The R&H office flourished. By 1956 it had moved to 488 Madison Avenue (where Williamson Music was ensconced), occupying a suite of ten rooms. The staff, having grown to over a dozen, included a General Manager, a Press Representative, a Casting Director an a Librarian, along with the requisite corps of assistants and clerks. Stage and movie productions required supervision; publishing deals, recording contracts and actors terms were in constant negotiation. Ongoing properties were maintained at high standards; new projects were being developed, or pursued. Casting for R&H productions was a cottage industry unto itself, overseen for many years by a remarkable man named John Feamley. R&H would spot fresh new talent in their weekly Thursday morning audition sessions and, like a baseball franchise, farm their rookies out to road tours or Broadway choruses until they were ready to call them up to the Big Leagues. Thus, John Rait was dispatched to the tour of OKlAHOMA! until CAROUSEL went into rehearsals, and Shirley Jones toiled in the choruses of SOUTH PACIFIC and ME AND JULIET before it was time for the OKlAHOMA! film to start shooting. Third, that Rodgers loved to micro- manage the staff while Hammerstein was all too happy to stay out of their way...Well, that story may have been true. From SOME ENCHANTED EVENINGS (1955), Deems Taylors contemporary account of R&H: The one place to which [Hammerstein] never goes, if he can possibly avoid it, is the Rodgers and Hammerstein office on Madison Avenue, which he regards with simple loathing. This is Rodgers domain. What with guiding the fortunes of their musical plays, to say nothing of their activities as play producers, Rodgers and Hammerstein are decidedly Big Business. And Rodgers takes an active hand in that business whenever he is in New York... Even when he is not actually in the office he keeps in constant touch, telephoning in, or leaving telephone numbers where he can be found at any hour. AU this leaves Hammerstein a little wide-eyed, his conclusion being that he must like it, or he wouldnt be doing it. A key factor in their success was unity. Whatever disputes or disagreements Rodgers and Hammerstein may have had with each other; they kept to themselves. Strategies and priorities were thrashed out behind closed doors, and when they emerged, the duo spoke as one. This single, ampersanded persona was carefully cultivated through public appearances, which were frequent, rarely was either man celebrated without the other. With extraordinary foresight, R&H knew that public relations was a vital part of running a business. They were early and frequent guests on THE ED SULLIVAN SHOW. They were profiled in Time, Life and Collier's They were interviewed by Edward R. Murrow, skewered by Groucho Marx, feted by President Eisenhower. They were even a plot device on I LOVE LUCY. Like their compatriot, Walt Disney, R&H recognized that their public profile was a self-endorsement of their product, and they strove constantly to maintain the joint iconic status their works had given them. Rodgers especially, wrote Frederick Nolan in THE SOUND OF THEIR MUSIC (1978) felt that the name of Rodgers and Hammerstein should be kept constantly in front of the public; that it would help to sell tickets. To that end, he and Oscar became the most available composer and lyricist in theatrical history. This courtship of the press had other benefits too; though agents and performers who faced off against R&H (or their brilliant lawyer Howard Reinheimer) may have had war stones about their fierce bargaining tactics, the public image belied the gossip. When Cleveland Amory profiled the team in a February 1959 issue of Holiday Magazine, his headline called them, The Nicest Guys in Show Business. 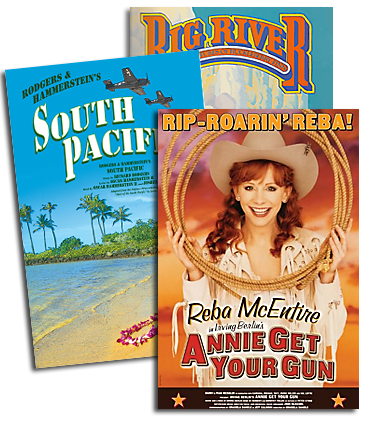 R&H wrote eleven musicals in seventeen years an astonishing feat by anyones standards. At the same time, they built a hugely successful business and corporate empire. It would undergo changes and transformations, but the basic structures they put in place sixty years ago still stand today. With the possible exception of The Shubert Organization, no other firm on Broadway rivals R&H in longevity or endurance, and nowhere else is the writer more revered. If you dont have a dream, the song goes, How you gonna have a dream come true?